The origins of the Waltz go back hundreds of years. The rhythm came to Vienna in the early 1800s, and the Viennese Waltz was first exhibited in America in 1834 in Boston. Especially at the beginning of the 20th century the slower Modern Waltz, danced at about half the original tempo, developed along with the Viennese Waltz. The Modern Waltz is smoother, less frantic, and more varied. We turn left, then right. We dance forward and back, we pause, and we can spend a measure or more developing this or that "picture" figure. Perhaps the most consistent feature of today's waltz is the pronounced, controlled, wave-like rise and fall as we progress around the floor. The first beat of each measure is a heavily accented "downbeat." The music then rises to a crescendo through upbeats 2 and 3. At the end of beat 3, the music falls again. The dancer feels this swelling and contracting in each measure. We rise and stretch with the music. One dancer described the feel of waltz music as "BOOM, cha, cha." I don't know about the "cha-cha," but beat one certainly is dominant. Lower in the knee at the end of beat 3. Many figures end with a closing step that helps accentuate this "fall" (compare to the passing steps in foxtrot that keep you up more of the time). Stay down through count 1 with a heel lead, rise during 2, and stay up into 3: down, up, up; down, up, up. Often, we stretch count 2, borrowing a little time from 1 and/or 3, delaying and extending the rise, "milking" the body flight, smoothing out the turn of the figure. There is strong body sway toward the center of the turns. In closed position facing line of dance, step forward L, side and forward R, close L; (may begin with trail feet). The closed change is not a standard round dance figure, but a ballroom term. It is a simple figure that changes the free foot from one to the other. You may have been doing left turning figures. After a closed change, you can now begin doing right turning figures. May be done in other positions. Return weight to the free foot that has not moved appreciably from its previous location. The foot may turn if required. There is no weight change. We bring the free foot smoothly and more or less slowly toward the weighted foot and touch. For a little more drama, we can sway toward that moving foot. Often preceded with a side step. May use either foot. Timing may vary. With either foot, step forward, in front of, and slightly beyond the weighted foot. Take weight. One can also cross behind. The cue can be more specific: e.g., cross left in front of right. A step forward by both dancers between partners. For instance, in SCP with trail feet free, a forward step would be a step "thru." Since the lady is a on the man's right side, the man's step would precede the lady's. May begin with either foot and from any facing position. Often cued Thru Face Close. From almost any position, cross, side, close; The cuer will tell you to twinkle in front or behind, or to twinkle to a given position. In sidecar, diagonal wall, you might twinkle out, man crossing in front and woman behind, turning to banjo diagonal center, and then twinkle in and turn back to sidecar again. Outside of round dancing, I think this sequence might be a "grapevine." In open position facing line, step back and turn 1/4 in. Step side, continuing to turn, and close. End in left open position facing reverse. You may now back twinkle to open again, beginning with the trail foot. In butterfly, trail feet free, he dances fwd R, fwd L, close R; describing a RF arc in front of the woman (W fwd L, fwd R, cl L; trng LF), passing right shoulders, moving from the inside of the circle to the outside (W toward COH) and ending in a position that will be cued. May be done either LF or RF. In any position, turn away from partner, man LF and woman RF, and step fwd with the lead feet, fwd, cl; turning 1/2. Return to partner: fwd, fwd, cl; completing a full circle. Although this is a two-measure figure, each half may be used separately. Begin in open position, both facing line of dance, with trail feet free (man's right, woman's left). Step forward R (woman fwd L turning LF). As the man steps, he moves his right hand back to lead the woman's left turn, and he raises his left hand to further encourage her to turn toward him and to take his left in her right. His second step is forward L. She steps fwd R, continuing to turn under his left hand. If he is careful to position his left hand directly over her head, she will not be pulled to one side or the other. Finally, he closed R to L (woman L to R), and you end in wrapped position, both facing LOD, with the man's right arm behind the woman's back and his left arm in front of her. All hands are joined. With his arms around her and her arms crossed in front of her body, you are of course very close—in an embrace. The woman should be in front of the man and a little to his right side. The man should be a little careful, and this is often true as he leads his partner to do turns, spins, and other decorative flourishes—so often the woman is whirling away and the man is calmly guiding these movements. Anyway, he needs to keep his steps small, and he needs to adjust his movement to the woman. Here, she is dancing in a circle, and he could easily outrun her and pull on her. He needs to think about that and avoid it. Another thing he can do to make this more graceful and less jerky is to keep his hand holds very loose. You need to keep hand contact, but don't grip. Just try to make fingertip contact so hands turn easily and no joints get twisted. His arms are around her, but don't bind her. Keep the wrap a loose one. Note that the man moves across the line of progression from the inside of the circle to the outside. The woman stays on his right side. May be done in any position and in any facing direction, and the first step may also be taken forward or back, in which case the direction must be indicated: e.g., Forward Canter. May begin in other positions and orientations, so first step may vary. The essence is to move from some other position in two steps to semi-closed position, trail feet free. Could be cued Semi Chasse. May begin and end in other positions. May be danced side or back—eg. Back and Right Chassé. May start with the trail feet and turn RF—Turn Right and Left Chassé. In closed position facing reverse line of dance, step back L (woman forward R) turning 1/4 RF. Step side R/close L with slight left side stretch. This stretch is the "tipple:" tipping the upper body in the direction of progression. Finally, step side and forward R with another 1/8 turn to face line and center in closed position. May begin with the trail foot in which case the turn would be LF and the ending position line and wall. May begin facing LOD with trail feet free, in which case the cue would be Forward Tipple Chassé and the turn would be RF. In semi-closed position, step forward on the trail feet, lady turning to face partner in closed position, step side on the lead foot, and close trail to lead foot. Notice that there is no suggestion that the woman should step across in front of the man on her first step, as she turns. It is a straight step down whatever line of progression you are traveling and a turn to face. This puts her neatly on his right side in good closed position. The figure turns a little LF, depending on subsequent choreography. In the past, the pickup was regarded as a one-step action, and the whole-measure figure was cued "pickup side close." In semi-closed position facing line of dance, step thru with the trail foot, leading the woman to begin a left-face turn. Step side and forward L to closed position line. On the third beat, cross right in back of left (woman LIFR) turning slightly LF. It is really the body turn that creates the locking action. We turn the body and so drag the free foot up behind the supporting foot (and then take weight). Sometimes cued Left Turning Lock to distinguish it from the right turning lock (below). The first measure alone might be cued Forward Box or Forward Half Box. The second measure alone is a Back Box or a Back Half Box. You might begin in closed position facing reverse and wall, in which case, the cue might be Back To An Open Finish. The man would turn LF too, and you would end in contra banjo facing line and center. In Foxtrot, this figure would be called a Feather. From shadow position, the lady had to turn 1/2 LF during the open finish. In De La Mer Waltz by Nolen there is a telemark to SCP; open in & out runs;; fwd 3 to BJO; open rev trn; Here, the "fwd 3 to BJO" is an open finish or a feather. For the man, this is almost a normal left turning box. The woman has to do the "lacing." That was the first measure of a normal left turning box. Now the man steps bk R raising lead hands and trng LF, sm sd L, cl R. The lady steps fwd L under lead hands, sd R, sd & bk L to left open position COH. She has "laced under" as he danced his back half box turning. In the third measure, the man dances a forward half box turning and the lady continues around to face. The M steps fwd L trng LF, sd R, cl L (or a thru, fc, cl to accommodate the lady); and the W steps fwd R, L, cl R in a RF circle to CP RLOD. During this "lacy" flight, the lady can extend her arms like a swan on wing. The last measure is bk R trng LF (Wfwd L), sd L cl R to CP wall. I feel sure that I have seen another form of this figure, in which the lady does a lace across in measure 2 and again in measure 3. That is, she goes under twice. I can't find my reference, though, so if you know of such a dance, please let me know. In this second version, in measure 1, the M steps forward L turning 1/4 to the left, side R, and then close L. The W does the "natural opposite" (back R turning, side L, and close R). End in CP, man facing LOD. This is a normal measure 1 of a left turning box. In measure 2, he steps back R turning 1/4 LF so he faces COH and raises his left hand for her to go under. The W steps forward L beginning to turn RF. The second step is a small side L for the man and a forward R, walking in a circle, for her. Finally, he closes R to L and she finishes her "lace" with a forward L to end facing him again, in CP COH. Meredith tells me that this feels more like an underarm turn than a lace. In measure 3, the M does modify his steps a little. Normally, he would step forward, side, close. Here, he steps thru L so he isn't stepping into the W but a little past her. Again, he turns 1/4 LF and he raises his lead hand for her to go under a second time. His second step is side R, and then he closes L to R to face RLOD. The woman steps forward R, L, R in a "lace" or underarm turn to end in CP RLOD. The last measure is normal. He steps back R turning 1/4 LF, side L, and closes R to L to end in CP wall again. She does the natural opposite. You might notice that the end result of all this is exactly the same as a standard left turning box, so you can do the lacing or not, as you like. This is a waltz box interrupted with a 2-meas underarm turn. Note that the man dances 2 waltz boxes. During measures 2 & 3, the lady dances 1 full turn RF. In facing position, wall, no hands joined, step forward and turn 1/4 LF (woman steps back). Step side and close. You will be right shoulder to right shoulder, man facing line and woman reverse. Continue turning LF: back turning (woman fwd), sd, cl; Now you are back to back, man facing center and woman wall. Forward turning, side, close; (you are left shoulder to left shoulder) and finally bk turning, sd, cl back to facing position again. Each turn (each measure) turns up to 1/2 RF, as described, but we often turn less. For instance, if we turned only 3/8 per measure, we would end with the man facing wall, rather than RLOD. We can begin this figure facing LOD if we dance the second measure first (M's R foot free) and the first measure second. Either measure may be danced individually; the cue would be "one right turn." Actually, the third step includes strong right-side lead such that the man's upper body will almost be facing COH (contra banjo). May also be done from semi-closed, in which case the woman's first step would be forward. This is an Open Natural Turn with an extra step, a syncopated Open Natural. In semi-closed position, step forward R (woman bk L) turning right face with left side lead. Step side and forward L (woman sd & bk R) continuing to turn. On the third count, continue to turn body to a contra position and step through to contra banjo, diagonal reverse and wall. May begin in closed or banjo positions. I understand that the Hairpin used to be a waltz figure only— essentially a syncopated curved feather starting with the lead feet (1, 2/&, 3;)— and the term "feather" was reserved only for foxtrot. But the two terms are used almost interchangeably in foxtrot and waltz today. In closed position facing LOD, step forward R beginning RF turn (woman back L), fwd L with strong left-side stretch and left-side lead, fwd R outside partner to tight contra banjo and thighs tightly crossed; The strong left-side lead makes the turn sharper, like a hairpin turn in a mountain road. In a curved feather check, you end facing DRW; in a hairpin, you are more twisted and almost facing DRC. I have also heard the interpretation that a Curved Feather can be relatively gentle or sharply turned like a Hairpin, so the name Hairpin should be reserved for figures that are syncopated (reflecting its syncopated waltz roots? ), as in "pivot to a hairpin [12&3;]. So a Hairpin might be quicker, as well as being a sharper turn. We have talked about the pivot and the hairpin above. This figure is a combination of the two—a "pivot one" and then a "quick" or syncopated hairpin. In closed position facing LOD, step forward L (woman bk R) turning up to 1/4 LF, side R turning up to 1/4 LF, close L; bk R, sd L, cl R; to end facing wall or as much as LOD again. Notice that this is not a foxtrot Reverse Turn. The more gradual rise used in waltz and the more pronounced side step do not lead a heel turn for the woman, and the amount of turn is usually less. However, in American-style waltz, the third step of each measure is a passing step, rather than a closing step, and the figure is more foxtrot-like. Note that one left turn turns you 3/8 while one reverse turn turns you 1/2. May begin in banjo or closed position. In closed position throughout, step forward L beginning LF turn, side R continuing turn, cross L in front of R (woman close R to L); back R turning, side L turning, close R to L (woman XLIFR) to end in closed line; One full turn. One of the problems that arises in doing these turns on the cardinal directions (RLOD; LOD) is that we tend to separate a little from our partner in order to fit in that cross-in-front step. We stick our butts out and then hunch over our partner to compensate. Maybe worse than that, we don't quite achieve a full turn, we end the figure facing wall instead of line, and we can't then do the open telemark or double reverse spin that comes next. We can keep our hips together more easily and our top lines apart, and we can get all the way around, if we dance this figure on the diagonal. Do the first turn to face reverse and center (woman line and wall) with strong right side lead (man's right shoulder back). Keep your left side in to your partner. In this strong contra-body position, the crossing step occurs easily and in a more flowing manner. If you have turned to face dead reverse, then the left foot crosses in front of the right with more of a clunk. Now do the second turn to face diagonal line and wall with the man's left shoulder leading and the woman's right shoulder strongly back. Again, keep your left side to your partner. Her crossing step will flow easily. You can dance any number of full Viennese Turns and never fall behind if the man throws his right shoulder down the line, and then his left, right, left … Focus on progressing down line with both your step and your shoulder, and the turns will happen. Notice that this is simply a preparatory step and then a quick or syncopated viennese turn. It is a way to do a one-measure viennese turn starting with the trail foot (and I do love the feel of that terminal syncopation—the 3& slips into place so smoothly). In semi-closed position, step back on the lead foot, the woman beginning a LF turn (pivot) on the ball of her right foot with thighs locked and left leg extended. The man steps back R turning slightly LF and keeping his left leg extended forward as she continues her turn and steps fwd L just outside his R foot. This is the "slip" action. On the third beat, step fwd L (woman back R). There is a general rule associated with slip movements that says, if there is no or only a little LF rotation of the couple, then the woman steps L outside the man's R. The man will use his frame to control this. If the man intends to turn the partnership, say, 1/4 LF, then he will guide her to step L between his feet. This will allow him to turn LF during the third step and end in closed position. If she had slipped outside his feet, the turn would have put them in banjo. The lilt is considered to be a foxtrot action, but it is broadly used. It is a forward step, then a closing step and soft rise onto the toes (don't turn it into a bounce). A lilt pivot adds a little left-face rotation. The man turns left to lead the pickup, but often he really doesn't pivot much. The "pivot" in this lilt pivot is really the woman's as she turns to face him. Keep the shoulders level throughout. In closed position facing reverse line of dance, step back L lowering and bringing the woman fwd R between his feet. Begin a RF pivot 3/8. On beat 2, step forward R between lady’s feet with a heel lead and continuing the turn on the right heel, rise up into a hovering action onto the ball of the right foot as the woman brushes R to L. Finally, recover side and back R to CP DLW. The man should control the amount of turn, depending on the choreography; the figure may be underturned or overturned. The woman allows him to do this by waiting to take her third step until she feels him begin to take his. A second standard ending position is CP DRW, a turn of 7/8. The preferred cue is Spin Overturn. Again, the standard figure ends DLW (5/8 turn), but the figure may underturn to face LOD or overturn to face reverse and wall or even RLOD. When the amount of turn wanted is other than 5/8 or 7/8, the cue should be, spin turn to a particular facing direction, such as wall. End facing reverse and wall. Sometimes, dancers feel that they can't get far enough around when they are asked to overturn a Spin Turn. The secret is in the second step. First, ladies, keep a strong left head. This will add to your turning momentum. If you pull in to your man, you can stop the rotation dead. Second, milk that beat. Don't be in a hurry to put your lead foot down. Ride the spin until you are where you need to be, and only then recover onto the lead feet. If that isn't until the "&" of beat 3, that's okay. Don't even think about that third step, and certainly don't plan a leaping or lunging side step at the end, thinking that this might take your farther around. The woman drives as she steps forward on her left. The man drives as he steps forward on his left. Right here, think of your frame as a rectangle, instead of an oval, and ladies, put your head in that back left corner. Then ride the momentum around. Let the free lead leg just hover behind the weighted leg, and you should actually feel the need to put the brakes on as you spin even to RLOD. The term "running" refers to the syncopation in this figure. It is a syncopated Overspin Turn. 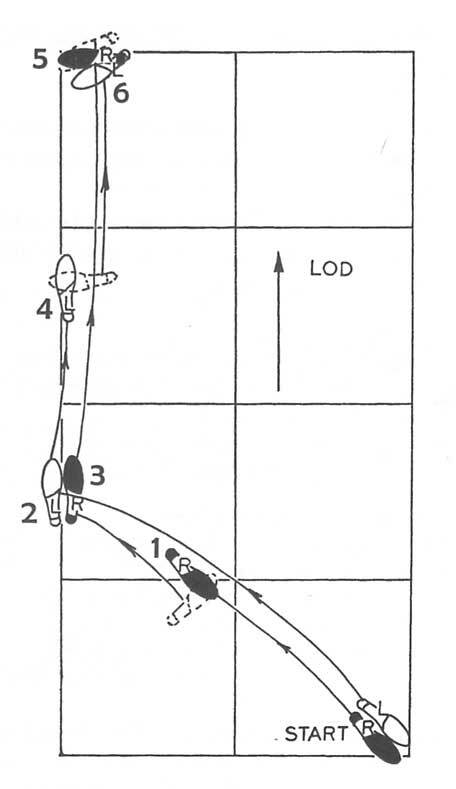 In closed position, reverse line of dance, lead feet free, step back commencing RF pivot, step forward between lady's feet turning, and step side to face diagonal reverse and wall; During this first measure, you are dancing an overturned spin turn. Now, the trail feet are free. The man hooks his R behind his L with no weight, and she steps fwd L/R around him. On beat 2, she steps fwd L turning RF and unwinding him. He changes weight as she does so. On the last beat, he steps side and back L, and she steps between his feet R. End in closed position facing diagonal wall, wall, or even diagonal reverse and wall. Do a spin and twist overturned to face reverse, and then do another twist turn. One of the problems inherent in this "double twist turn" lies in the long side step L that overturns the first twist turn and prepares you to do the second twist turn. It can become an abrupt leap that disturbs the smooth flow of the waltz. Again, a twist turn for the man involves two weight changes. He hooks his right behind his left. She unwinds him. He takes weight on his right on beat 2, and then steps side L on beat 3. You can smooth out a double twist by taking four weight changes and by making the third step a progressing pivoting step. Hook R behind L taking weight/step L as she begins to unwind you. On beat 2 step forward R and pivot in a maneuver action, and then step small side L to set up for the second twist turn. The count becomes 1/&23; just as it is for the woman, and the flow is so much smoother than the usual "hook/unwind, step, leap." This is the dance in which we learned about the smoother version of a double twist turn. Begin in closed position, trail feet free. The man hooks his R behind his L with no weight, and she steps fwd L/R around him. On beat 2, she steps fwd L turning RF and unwinding him. He changes weight as she does so. On the last beat, he steps side and back L, and she steps between his feet R. May also end in semi-closed position. This is a tango figure and consists of two twist turns, first the man and then the woman. In closed or banjo position facing reverse, step back L, back R turning LF, and then a side step to either banjo or to semi-closed facing line; When ending in banjo, the man's last step is side and forward, and the woman keeps her head closed (left) throughout. When ending in semi, the man's last step is side and back, and the woman turns her head right on the last step. Note that, as in the closed change, this figure serves to free up the trail foot—you are "changing" from one free foot to the other. May begin in other facing directions and turn varying amounts. Note that this is a pivot 2, each step turning about 3/8, and then a non-pivoting step to SCP. Keep the knees soft throughout, and rise just a little at the end of the second step. In closed position RLOD, step back R (woman fwd L between M's feet) and spin to the left on the ball of the right foot. Stay low—no rise or fall and no sway. In CP LOD, turn and step fwd L between W's feet spinning LF. May progress LOD or RLOD. Multiple pivots are made by alternating the actions described above. This figure is the same as a back feather in foxtrot. Sometimes this figure is curved a little LF, like the second half of a reverse wave in foxtrot. We are so used to dancing the impetus to face line that the impetus in Waltz Tramonte can be a real "gotcha." Men, remember to step back and heel turn RF, no matter which way your are facing at the start. Keep steps small. Focus on the turn, not on progression. Total turn is up to one full turn. It seems to me that the important step is the third one. This is the spin, and in some choreography the spin is a full 1/2 turn (making one full turn for the whole figure). Given this and given that it is difficult to spin as a couple in banjo position, I have two thoughts. I think that the timing 1&23 would give us a little more time (a full beat) for the spin -- to accomplish the spin but to show it off, too. Second, that forward step should be small, and the lady's back step should be L behind R, under the body, putting her L close to his R and creating a more contained pivot point for the couple. It seems that the left sway and the smooth LF rotation throughout should lead that behind step for the lady. I'm having trouble with this figure right now, so I'm not sure that these strategies will make it more comfortable. I know I need to keep my top line back as I step forward into the spin. We're working on this one. By the way, compare this waltz top spin to the foxtrot top spin (use the index) -- totally different, and the foxtrot version is much easier. Our teacher recently compared the waltz top spin to the tumble turn, which is the same back R trng LF, sd & fwd L trng/fwd R rising and pivoting LF, and then fwd L to the tumble rather than bk L as in a top spin. So, the final step is very different in these two figures. As I have said, the steps of the top spin are smaller, and the focus is more on the turn, on the spin. In the tumble turn, there is more progression. But we often feel very comfortable in a tumble turn, and I'm going to try to use whatever technique I have in that figure to make the top spin flow more smoothly. Begin in closed position, often facing line and wall, with the trail feet free. Flex the left knee and lower, step side and slightly forward R between her feet (woman steps side and back L), flex the right knee, and stretch the left side to produce a little right sway. The sway will close her head: she will look left and he will look right. On the second beat, rotate the upper body up to 3/8 RF, lowering just a little more to help you get your lower body back under yourself, and recover L rising and rotating LF. This is the "roll." Then slip the right foot past the left for a back R (woman draws L to R and slips forward L) turning LF and lowering again to closed position facing line and center. This figure can be softened (made easier) by taking up to two measures. The extra time allows you to extend the right lunge during one of the additional beats and to display the roll and create a high line during another. This is a figure where shoulder lead really contributes to comfort and ease of execution. Men, keep your right shoulder back. Your hips and belly button should be facing DRC and your partner, not RLOD, past your partner. Women, your left shoulder is forward. Your hips are oriented toward DLW and partner. You are not oriented square to the line of dance but are angled, "slicing" your way down line. The advantage of this angled body orientation is that the locking steps occur easily. The free foot is lined up with the supporting foot, so when you bring it up it naturally runs into that supporting foot and locks. If you dance this figure more side-by-side, man facing RLOD and woman facing LOD, then your free foot is to the side of your supporting foot. To lock it, you must move it laterally, swing it around the supporting foot and hook it. It is an awkward effort. In a sliced position, the lock is a smooth result of the step itself. Notice that the man is doing a Forward Waltz down line, and the woman is doing a roll-three under joined lead hands, also down line. Some awkwardness to watch out for is veering away from your partner. Especially during the "roll" the woman can lose track of direction and veer toward the wall or even into her man. It is also helpful if the man will keep his lead hand open so than the woman's fingers can turn in his palm. If he grips her hand, it can hurt. This is really a basic square dance figure done in four steps, but it is also done in three steps as a phase II waltz figure. In open position, trail feet free, raise joined trail hands and walk R, L, R; curving RF around the woman. She walks L, R, L; curving LF under the joined hands. You end in open position facing reverse, the man on the outside of the circle. Let me add that it is easily adapted to other rhythms. In two step, we dance the figure qqs; qqs; The key is to do it with trail hands joined, lady under trail hands, ending in OP. A twirl vine to reverse line beginning with trail feet: The man steps side R, raising lead hands and bringing them between partners. She steps side and forward turning 1/2 LF. He crosses LIB of R, and she steps side and back turning another 1/2 to face, and both step side. Underarm Turns are more Latin in nature than Smooth. This figure might better be called "Syncopated Twirls." But round dancers are certainly not shy about borrowing both figures and terms. Sometimes the wheel is done with all fwd steps and therefor more progression and perhaps less rise and fall. (12&3&; 1&2&3;) The standing spin is not a standardized figure but a general term for any compact run-around in which partners are in an upright, high body-rise position. It can turn LF or RF with few or many steps. So it is a syncopated wheel but very tight and compact and with high body poise. Here is one version: In BJO DLW with lead feet free the man initiates RF upper-body turn and the lady steps forward R. Now we have same footwork, and both trip lightly, compact and high, in a tight RF circle, L/R, L/R, L/R. In all, we might wheel 2 full turns. The man has taken 6 steps, the lady 7. The man finishes with 2 final steps (2,3) and the lady dances 3 (2&3) completing the wheel and transitioning back to opposite footwork. We might end where we began: BJO DLW ld ft free. Note that we are both running and we are "spinning" around a central point located between partners. Another option would have the man standing on the ball of his R foot while the lady runs tightly around him, again remaining in BJO throughout. It would be something like a man's royal spin or horse and cart. The man is indeed both standing and spinning, rather than wheeling -- a better representation of the name of this figure -- but I have never seen it used this way. With lead hands joined, step fwd L (W fwd R), fwd, cl; the man turning to the right and passing on a diagonal path behind the woman and the woman turning to the left and passing in front of the man, under his lead arm, to LOP. The man moves from the inside of the circle to the outside. This figure is specifically cued "lace across" when the man moves from the inside of the circle to the outside and when the woman passes under lead hands. Often, we will be asked to "lace back," and the man will move back to the inside of the circle and the woman will pass under trail hands. May begin in other facing positions. Total turn varies from 1/8 to 1/2. In closed position facing line and wall, step fwd turning LF, fwd with right side stretch, draw no wt to line and center; (two weight changes, end with lead feet free) Follow with a turn left and right chasse or diamond turns. May begin in other facing positions. Total turn is about 3/8. The figure can begin and end in a variety of positions. In closed position facing reverse line of dance, step back L (W fwd R) turning RF, step side and fwd rising and continuing to turn, small step to semi facing diagonal line and center, trail feet free. The beginning orientation can vary. The man turns up to 3/8; moving from CP to SCP, the woman will turn more, up to 5/8. We can also dance this figure starting with the lead feet and turn it RF, and we can dance it from other facing directions. Note that in this second example, the first hover corte turns RF and the second is almost standard (we begin the second one in SCAR LOD). This is a hover corte in which the man takes only one step. It can have an elegant, soaring feel. This is a progressive figure with each step being taken along a diagonal. May begin in banjo with the trail feet free. The woman may brush her free foot to the supporting foot at the end of the second step. The figure may end in semi-closed position if so cued. In this case, the woman will turn strongly at the end of the second step and her last step will be forward. In semi-closed position facing line of dance, both step thru with the trail feet, and the man uses LF body rotation to lead the woman to step side R around the man turning left. She continues to turn and closes left to right to end in contra banjo, man facing reverse and center. One step for the man and three for the woman. May begin in other facing positions. Total turn varies from 1/4 to 3/8. In semi-closed position, step forward on trail foot turning RF, forward again continuing to turn and rising (woman stepping between his feet), and then recover back on trail foot still progressing down line and still in semi; Total turn is 1/4 to 1/2. Each step progresses; no step moves to RLOD. In CP DLC step fwd L with R shoulder lead and with right-side stretch (W bk R turning LF). Sd R to SCP RLOD and then back L well under the body. We still have sway toward RLOD. This is our first of the three fallaways. Second measure: step back R turning LF and bring the lady to CP RLOD with no sway. On beat 5, step back and side L with left-side stretch = right sway (W side and back R) to RSCP facing RLOD, W on the outside of the circle. Step back R well under body (W bk L). We have danced the second of our three fallaways on counts 456. Now turn LF and step fwd L to CP LOD with right-side stretch = left sway, side R turning, and back L well under body to SCP RLOD. We have danced the third fallaway on counts 789. This figure is comfortably danced if we pay attention to our positions and make our SCP and RSCP properly tight. Each roll across becomes a tight slip and fold to the next position with little separation between partners. Notice that the standard figure is linear, progressing down LOD, first to SCP, then RSCP, and finally SCP, all facing RLOD. If we start facing DLC and end RLOC, the total turn is 1 3/8. The amount of turn may vary. In the ballroom world, three fallaways is not a linear figure. It makes conspicuous use of the diagonals, and you might enjoy this little different shape. Specifically, the first four steps progress toward diagonal line and center (DLC). Steps 5 & 6 go down LOD, and then steps 7, 8, & 9 move toward DLW. "Like the shape of a frying pan," says one of our teachers. If you can imagine looking at the pan in cross-section, edge-on, we dance down the slanted side of the pan, across the flat bottom, and up the other side. We move diagonally in and then diagonally out again. It's a gentle flow, the changes from SCP to RSCP and back are a little easier, and it's a nice alternative to straight down LOD. Here is a detailed description that emphasizes the diagonals. In CP DLC, step forward L (W back R) turning LF 1/4 and with right side stretch (woman left side). Step side R in SCP facing DRW, and cross lead foot in back of trail foot. The second fallaway begins with a step back R still toward DLC and turning to CP with no sway. The woman steps forward L and slips to closed; she is facing LOD. Step side L directly down LOD, now with left side stretch, leading W to step side and back R to RSCP, and cross trail foot in back of lead with a strong LF "wind-up" in the torso as in a left whisk. The man is on the inside of the circle. Finally, step forward L (woman back R) toward DLW turning LF now with no sway. The man is rolling across to the outside of the circle. Both step side with the trail foot and then cross the lead foot behind to SCP facing DRC. The total turn here is 1 1/4. One of the pitfalls in this figure is making the second step a side step. You are progressing with the thru step, and somehow you want to keep going. Don't. Close, face, and step side on the third step. The closing step allows for a cleaner rise and fall. May begin in other facing directions; usually turns 1/4 to 3/8 RF. As you take steps 2 & 3, your hips will be turning RF (woman LF), but your upper body should lag behind, producing a strong LF "wind-up" in the torso. Stay flat - does not have the strong rise of the normal whisk. The ending position feels like a hinge for the woman. Note that the man has only one step, and the woman has three. The man rotates about 1/8, and the woman turns 1/2. There is just a little LF rotation here, so in semi, the man begins facing line and wall. At the end, he might be facing LOD or even line and center. Notice that the wing involves only one step for the man and so doesn't progress much. The progressive wing involves three steps for man and woman. This is a two-measure figure, but the man's first step onto his left foot is considered to be the last step of the previous figure. On the last "&" count of the second measure, the man closes R to L, and the woman takes her last run fwd L to end in sidecar position facing reverse line of dance having turned 1 & 3/4 LF. The man may paddle around with his R to aid the turn. The amount of turn, number of steps, and timing may vary. Note that in this example the man is not on his L at the start of measure 1 -- he steps L on beat 1. Also, the lady's timing is 1&2&3&; 1&2&3. Again, the man steps L on beat 1 and only 1 measure is used. The timing for the lady is 1&2&3&. Indeed, the details of the continuous wing "may vary." 123; 123; 123; 123; In semi-closed position, trail feet free, release lead hands and step thru, man turning RF, step side & fwd L continuing to turn to face COH and scooping partner up with man's L under woman's R arm, forward R blending to left half open position facing COH; In the second measure, the woman comes across as the man did, ending in half open position facing RLOD; repeat measures 1 & 2, first to left half open position facing wall and then to half open position facing LOD. The Square is a slow two step figure where it begins with the lead foot and consists of four underturned switches, turning 1/4 LF each measure. In waltz, it begins with the trail foot and consists of four underturned open in and out runs. In waltz, the figure has been called "square the runs," which is a nicely descriptive name. We'll see how the standardization discussion goes. In the Shawvers' Sam's Song, you are in closed position facing diagonal line and center with trail feet free. For the first develope, the man steps forward R with a little left side stretch and RF upper body rotation. This turns the woman to sidecar position as she steps back on her left, and then she developes with her right toward reverse and center. For the second develope, he crosses L behind R with a little right side stretch and LF upper body rotation. This turns her to banjo as she crosses R behind L and swivels LF to develope with her left toward reverse and wall. There are three features of the sequence, given at right, that are unusual. First, there is the overturned outside spin to get you in position facing line and center. Second, a typical develope begins with a step outside partner. You might be in banjo, you step forward R, she steps back L, and she developes; or you are in sidecar, you step forward L, and she steps back R and developes. In Sam's Song, we are in closed position, and we have to arrange a little swivel, first right, then left, so she can develope outside of you. Third, she is doing her develope with the outside foot. Usually, she uses the inside leg, closer to the couple's center of gravity and so maybe more easily on balance. More than the question of balance, and especially if you have good contra body position, a develope with the inside leg might have a bit of the feel of a leg crawl, as she raises her thigh against your supporting leg, just before she extends the knee. A develope with the inside leg simply has a different feel, which makes the double develope feel different. This is a Spin Turn begun outside partner. The man must initiate his right turn early, because the woman has a greater distance to go. In contra banjo, facing reverse and wall, turn upper body RF leading woman outside man and maybe sneaking a very brief look in her direction, and take a small step back with lead foot. The toe of the left foot might be at the instep of the right and toed in. On this first beat, the woman takes a large step around the man turning RF maybe 3/8 and rising to her toes. 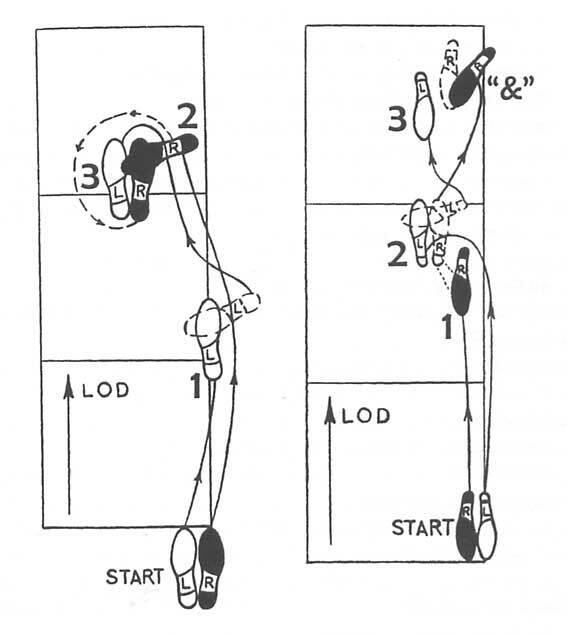 On beat 2, the man steps around the woman with a strong heel lead (unusual in waltz on the second step), turning another 3/8, and he should not be looking at her at this point. He needs to shift left back into good dance position. He rises into a hovering action, and she does a toe spin on her right and changes weight to left at end of beat. This spin is up and hovering. Let it extend into beat 3, and at the end of beat 3, he steps side and back lowering, continuing to turn, and she steps forward between his feet with a toe exit to closed position. The total turn could be as much as one full turn. Cunningham's Moulin Rouge has a diamond turn one half checking;; to an outside spin; and then a box finish; repeat;;;; The sequence begins diagonal line and center and ends the same. Again, in banjo, usually reverse and wall, turn upper body RF leading woman outside man, and take a small step back with lead foot. The toe of the left foot might be at the instep of the right and toed in. On this first beat, the woman takes a large step around the man turning RF maybe 3/8, just like the beginning of an outside spin. On beat 2, the man steps outside the woman with heel lead, and she continues to turn in a toe-spin (like a heel turn but on the R toe, rondes her left foot CW and raises the left knee to bring the left foot to the right knee, toes pointed down, no weight change. This leg movement is like a reverse develope. Instead of "knee/kick" (develope), swing a straight leg and then knee. During the spin, expand the top line, that is, keep the upper bodies apart, and allow momentum to develop. On beat 3, he brings his left foot under his body with left side lead and steps side and forward to contra banjo, and she lowers her foot to a touch. The end of this leg movement feels like a leg crawl. Three steps for the man and one for the woman; one full turn. This is one of those figures where the woman takes a step and then simply spins in place, as the man steps around her. Others are the Tornillo Wheel and Ballerina Wheel in Latin. Since the woman is fixed at the center of a circle, the man must step exactly on the circumference of that circle. His steps must curve. They must not go "fwd/turn, fwd/turn" in a sort of square, but "curve, curve" in a circle with left side lead. Otherwise the woman will be pulled over, this way and that. It's especially tough in Smooth, because you are in contact and have less chance for adjustment. In Latin, there is space between your bodies, so you can adjust with the arms if the feet go astray. In semi-closed position, line of dance, trail feet free, simply step thru with a slight lunging action and soft knees. 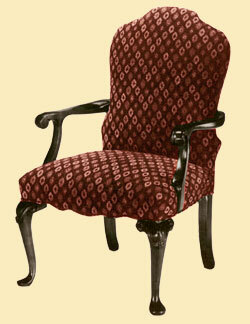 The curve of that trail leg should suggest the leg of a Queen Anne chair. In closed position, lead feet free, lower into your right knee (woman left), begin LF rotation, and slide the left foot forward. Your left foot is moving forward as your right side is leading strongly. This is the contra body action. Of course, the woman is lowering and stepping back R, allowing her toe to slip across the floor. His left thigh is actually pushing into her right thigh. Only when she feels the man stop and begin to change weight, will she stop that slipping foot movement and take weight herself. She must wait. The LF rotation causes the man to turn his left foot out. If he is facing DLW, his toes will be pointing LOD. This angled foot placement helps a great deal in maintaining balance. The woman steps straight back R, but her CBM causes her left foot to angle out and may turn her right foot a bit in. All four feet end up pretty much in one straight row (her R, his L, her L, his R), but the foot angles and the tight contact at the thighs helps maintain balance. Hips are in—toplines are well apart—heads left. Timing varies. A slow contra check can easily span a whole measure. In closed position, lower into the right knee (woman L), begin to rotate upper body LF, and step forward L (woman back R). Keep your hips in and up and your shoulders well apart. On beat 2, recover R, and then slip back L (woman fwd R). In closed position, lower into the right knee (woman L), begin to rotate upper body LF, and step forward L (woman back R) in strong contra-body position. Keep your hips in and up and your shoulders well apart. On beat 2, recover R beginning to turn RF, and then slip back L (woman fwd R) continuing to turn about 1/4. May be danced with lead feet progressing toward LOD or with trail feet progressing toward RLOD and in other orientations. May begin with either foot and may be danced in any number of steps, to be specified in the cue. This figure is two open telemarks in a row, and the "&" count allows you to pick her up on the "one" and then dance a second "quick" telemark. May begin in banjo and in other orientations; normally 3/4 RF rotation. In this first measure, the woman has done an open telemark, but the man has held back and not taken that third step. The figure turns 1 3/8 LF. I believe that this represents the first description of the Telespin that we have had in round dancing. More commonly, we now dance a Telespin to Semi or a Telespin to Banjo (see below). This is the same figure as the telespin to closed, except the last step is a touch instead of a back, leaving the lead feet free. One attractive thing you can do in the telespin figures is to keep your shoulders turning, once you have initiated the turn. Don't execute the appropriate turn in the first measure, pause, and then whip into the second measure spin. Maintain smooth upper-body rotation over the whole two measures. The figure turns 1 1/4 LF. The figure turns 1 3/4 LF. The figure turns 2 & 1/4 LF. As in the case of the telespin, we often dance the double telespin to semi-closed or to banjo and so turn it 2 3/4 LF. This is essentially a Telespin with a woman's ronde in the second measure. One important difference is that the man takes full weight on his third step and uses only upper body rotation to lead the woman to step, kick, and spin. Of course, the second measure is the tricky part. The count is 123, but we are only taking two weight changes, and we take them at different times. The man only spins on count 1 and steps late on 2 and 3. The woman steps on 1 and 3. The Hover Cross is really a foxtrot figure, but it can be used in waltz if the second measure is syncopated. In closed position, diagonal line and wall, step forward R beginning to turn RF (woman back L), side L turning (woman heel turn), side R completing 3/4 turn to face line and center in contra sidecar; step forward L on toe outside woman with right side stretch, recover R/side and forward L, fwd R on toe outside partner in contra banjo with left side stretch; The last four steps of this figure are known as a hover cross ending. Where the Natural Hover Cross consists of 7 steps, the Continuous Hover Cross consists of 9. It "continues" for two more steps. Begin in semi-closed position facing line of dance with your trail feet free. Both of you step thru toward line (man forward right and woman forward left). The second step is forward left for the man beginning to turn to the left. The woman begins to turn left and steps side right to end in closed position. So the second step is a "pickup," but the man has turned too, so you aren't closed position facing line; you're more facing diagonal center or even center. Then the third step is side and slightly back for the man, still turning. The woman keeps turning and steps forward on her left. At the end of the first measure, you should be in closed position, man facing about reverse. From closed position, banjo, or semi-closed, the man steps forward R turning RF (woman bk L (from semi, she will step forward L)). In the second step, she draws R to L and he steps side L with left side stretch leading a heel turn, and she changes weight at the end of the turn. At this point, you have turned about 1/4 RF and are in closed position facing DRW. On the third beat, step back R with right side lead (woman fwd L). In the second measure, step back L with right side stretch into contra banjo (woman forward R outside partner). Step back R turning LF to closed position wall. Finally, step side and forward L (woman side R) with left side leading to banjo position facing diagonal line and wall. In SCP LOD, step thru with the trail foot turning RF and leading woman to swivel LF to face partner in closed position wall, point lead feet to side. One weight change. A Whiplash To Banjo is more common, in which the man turns less and the lady turns more, to BJO DLW or even BJO LOD. Here it is clear that the lady is the "whip." The man uses LF upper-body rotation and strong R sway to snap the lady into a strong, 3/8, LF turn to BJO. The man's head is right and the lady's head is strongly left (closed). Step to the side with either foot taking partial weight and stretching that same side of the torso and lifting that hip and so inclining away from the stepping foot. As you take full weight, straighten the body and so "lose the sway" and draw the free foot a little toward the supporting foot. "Sway" is really a general term that simply refers to inclination or tipping of the body, in this case, away from the direction of the step. Be careful not to overdo -- do not kink or crunch the opposite side of your body in your effort to tilt. Only gently lift the "stretching" side. Lamberty does this a little differently. 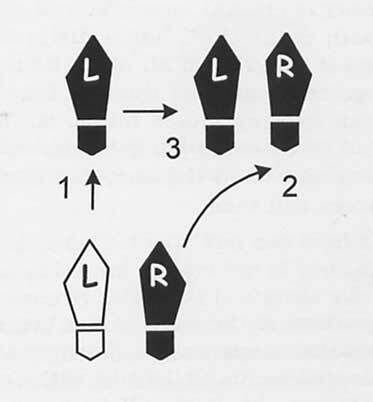 Rather than doing a standard open telemark, opening out at the end of step two and both stepping side and forward to semi-closed, he asks us to step back L on the third step (woman fwd R) and only then lead with the left side blending to a tight semi and promenade sway. This change gives us a much tighter connection and better lead into the sway. The man's motion is a little like "bowling the foot down the alley." It is a little more elegant for her to slide her foot back with the inside of the big toe touching the floor, rather than the tip of that toe. Look at your partner lovingly. This is a good place to think again about maintaining your whole frame. This "bowling" is rotation of the frame to the left. The man's right hip and right shoulder go forward. His left hip, left shoulder, and even the left arm and hand go back. Don't move any one part of the body by itself, but keep the parts of the frame toned and rotate the whole frame as a unit. This action gives the woman the space to dance her figure and prevents him from pushing on her (with his left hand) in an interfering way. In closed position facing diagonal line and center, step forward L ( woman back R) and begin strong LF body turn. On beat 2, step forward R thru the woman's left side. She has drawn her L to R, and the man's early rise (more like foxtrot than waltz), his rotation, and his pushing thru her as through a turnstile, leads her heel turn. At the end of beat 2, she changes weight to her left foot. On beat 3, the man continues to rotate but simply draws his left foot to his right with no further weight change. The woman steps side and back R and quickly crosses her L in front of R to end in closed position line of dance. There are two weight changes for the man and four for the woman. Different choreography calls for more or less rotation in a double reverse, and the step that controls the amount of rotation is the man's second step. Again, you begin facing diagonal line and center. Imagine a straight line drawn from your position on the floor out toward line and center. Your first step should be forward on that line. The man's second step is also forward (the woman's second step is a draw/heelturn/close). If the man steps a bit to the right of the line, the double reverse will spin about 3/4; on the line about 7/8; and a bit to the left of the line a full turn. The man must never take his second step straight down line or she will not do a heel turn, and you will end up with some kind of open reverse turn, the woman choked in the man's armpit. This figure calls for a lot of rotation in only one measure of music. You will turn as much as 1 and 1/2 LF. Do a full Double Reverse Spin, as described immediately above. Then the man and woman both take an additional step with the lead foot, turning. Lower into that lead leg to coax additional turn, and you will end in closed position, facing reverse line of dance, trail feet free. In the Shibatas' Le Cygne, part B begins with a reverse fallaway and slip; double reverse overspin; and back to a throwaway oversway; The sequence calls for almost three full turns over three measures. The timing at left shows weight changes — four for the man and 14 for the woman. You can think of this figure as the start of a reverse turn, check it, and then slip back close to where you began. Sometimes the cue will be checked double reverse and slip. This is the start of a double reverse spin, check it, and slip back to where you started. The checked double reverse turns a little more that the checked reverse, but they are very close to being the same figure. You can think of this figure as the start of a natural turn, check it, and then slip back close to where you began. Sometimes the cue will be checked double natural and slip. This is the start of a double natural spin, check it, and slip back to where you started. The checked double natural turns a little more that the checked natural, but they are very close to being the same figure. From closed position, step back on the right foot and turn 1/4 LF. Step side on lead foot with strong left side stretch, continue to rotate hips LF, leading woman to collect her trail foot and change weight. His left and her right hips are tight together. Flex left knee to lower and cause her right foot to slide forward, leg straight. With left-face upper-body rotation, you end in closed position with man's left knee flexed and his right leg straight and extended to his right, and woman's left knee flexed and her right leg straight and extended in front of her, parallel with his. She is almost sitting on his left thigh. Both torsos are up, not lunged or inclined. May begin in semi-closed position, in which case the first step is forward for both. This standard hinge is a Left Hinge, as she is on his left side. A Right Hinge would be a mirror image with her on his right side and left legs extended. Where the hinge has the right legs for both extended on a strong diagonal, the same foot lunge has the left legs extended into an attractive picture figure. Begin in closed position with trail feet free. Since this is a "same foot" figure, we have to do a transition. Often, the cue is "prep for a same foot lunge." The "prep" is a slight rise and right face rotation causing the woman to rise to her toes and change weight to her left foot. She has rotated a little RF but not as far as to semi-closed position—you are still closed. Her right knee is tucked just behind her left knee. Her right hipbone needs to settle into the hollow of his right hipbone (inside his right hip). Both now have right feet free. Now we can do the figure. Lower in the left leg, push, and step side and slightly forward R with right-side stretch and looking right. Give her your right side—that will close her head (woman steps back R turning LF and looking well left—very like a contra check step for the woman). The man's left leg will be extended to the side, straight and strong. The woman's left leg will be crossed in front of her right and extended on the same diagonal as the man's. Keep your hips well in to your partner. Again, you are in closed position (not an L-position). In many ways, this figure is like a right hinge (see above), but we have not lowere into an upright sit position. We have lunged or inclined — our upper bodies are extended to the man's right. In closed position, diagonal line and wall, step fwd between her feet, lowering with something of a chair-like feel. Your right knee will tap the inside of her right knee, leading the actual ronde. Turn your upper body sharply RF with left side stretch and left side lead, and then check that action by flexing the right knee while keeping the left foot back. She will step back L, turning to semi, and ronde her right leg CW but keeping right side in to man. Her right leg will cross behind, no weight change. Theoretically, the man can lead the height of her ronde with the degree of lift in his body, making the ronde quite aerial or letting it just skim the floor. He can also lead the duration of the ronde with the speed of his upper body rotation: just one beat or extend it over a whole measure. This figure begins in closed position, both with left foot free. Turn a bit so knees are outside but not fully to banjo, lower on the right and push the left forward to ronde the left leg CCW turning LF. On count 2, cross the left behind the right continuing to turn (on the & the woman steps side and back R), then slip back R (woman fwd L) to closed position; The woman is doing a little circular vine -- don't pull away from partner. The amount of turn is about a half, often from diagonal line and wall to diagonal reverse and center. Certainly, the usual pattern is double reverse to a split ronde. At the end of the double reverse spin, stop your rotation for good balance, lower a bit and turn just a little RF to lead the woman to release her right foot and change weight (her count for the double reverse becomes 12&3&), and then proceed with the split ronde. In closed position, facing line of dance, lower on lead foot and step side R between woman's feet, commence slight upper body turn RF. Woman steps side L. Use right-side stretch and rise to cause woman to raise R leg, bend R knee, move R knee back, and turn the R leg out so that the right calf, toe, and heel are all parallel to the floor. She does not so much lift the knee as send it back from the hip. She has left-side stretch with head well right. The Eros Line is a one-step figure with some similarity to a Rudolph Ronde. The man steps side and forward R between the woman's feet, rotating the upper body RF, which leads the woman to open her body and lift her right leg. In a Rudolph, the man follows through with his left side and gives left-side stretch. This action lifts her leg and causes it to swing pretty wide in a CW ronde. To lead an Eros Line instead, he stops his CW motion and uses right-side stretch, instead of left-side. It's as if he begins to lead her into this big, dramatic ronde, but then he changes his mind and checks that action. She does raise her right leg, flexes that knee, but instead of rondeing, she only moves the right knee back and turns the leg out so the right toe and heel are parallel to the floor. That is the Eros Line. It is not a big movement. It is a more static pose. Again, the man led the Eros by stepping side R but checking his CW motion and using right-side stretch and left sway to raise her leg but not ronde it. This is an interesting sequence. To change the Eros Line to the R Lunge Line, the man simply changes from left sway to right sway. There is no footwork, no change of weight. He loses the left sway, straightens his body, rotates a little LF. She lowers her R leg and straightens with him. Then the right sway puts both into a right lunge line. He looks right; she looks left. In semi-closed position diagonal line and center, step through R (woman L) beginning LF spin in a lowered position. This first step almost feels like a chair. He tucks his left knee behind his right knee and so leaves his lead foot behind him as he spins on his R. Stay lowered here. Early rise will stop the spin. Quickly on the & of the first beat, the man uses upper body rotation to lead the woman to step fwd R toeing in to the center, around the man's left side, much like a wing, and she commences a toe spin. Now with the feel of a split ronde, rise, spinning in place. On beat 2, he crosses LIB of right. The woman continues her toe spin. On beat 3, he slips a small step back R, and she slips forward L to closed position diagonal line and wall. The big top is an unusual figure in that the timing is different for the man and the woman. Both step on beat 1 but the woman takes her second step quickly on the & of 1, while the man waits as the spin occurs. He may even draw out the spin to the & of 2 and then quickly do the slip on 3. The Prows, in Pastorale, extend the spin even more and give a count of 1-3& for the man and 12-& for the woman. We can describe this timing with the mnemonic, "we, she, he, we." In CP RLOD, trail feet free, step back R lowering and beginning to turn LF. Step side and back L; the woman strongly side and forward R to remain in closed position. On 2 the man sneaks his R across to a contra banjo line of dance and rises with right side stretch, opening her head; she crosses behind. 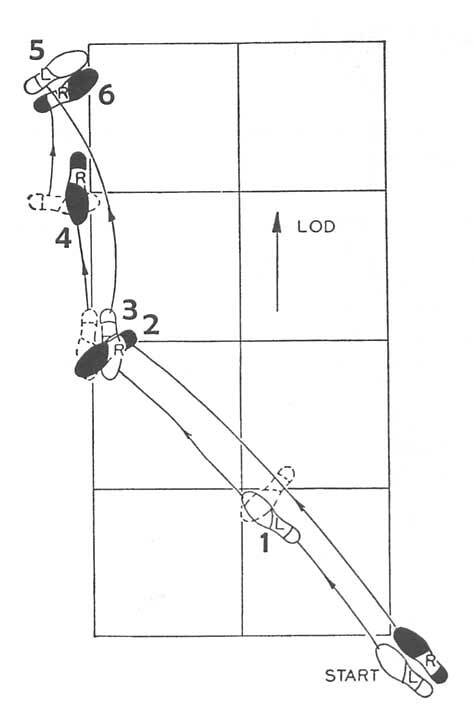 Lead feet brush up to trail as both swivel on the trail to face center, and he steps forward and lowers into a "contra" closed position COH or DRC. This last step is actually the "tumble" action, and the figure might be more accurately called an "open finish to a tumble ending." It is a little like a contra check. The actual step is shorter, but she has stepped side and back to move from tight contra banjo to closed, and he steps forward into her with right side lead (contra), lowering. In closed position, lower on the right foot with right-side stretch and extend the left leg to the side. Note that the man and the woman extend the same leg and so point in opposite directions. May be done with the right legs and left-side stretch. The action itself involves no weight change, but entry and exit steps may be choreographed. These steps, body position, and head positions all may vary. To execute that last figure, the man would step forward R on beat 1, turn to face partner and wall and lower into the opposition points during beats 2 & 3. The woman would have to step forward L and quickly close R, doing a transition (1&), and then similarly lower to opposition points on 2 & 3. This figure comes from the Shibatas' Tonight, a phase V waltz. In part A, we do an open telemark; curved feather check; and then dbl opposition pts;; The choreography departs from the standard action, but it retains the basic feature of pointing in opposite directions. 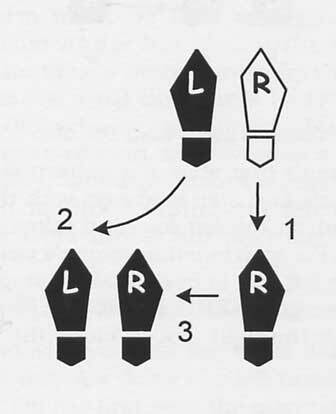 From contra banjo, reverse and wall, the man recovers L and the woman recovers R. He draws R to L leading the woman to swivel RF on her R and to draw her L to R. He flexes his L knee and extends his R leg to the side and back toward DLC with left sway and looking toward DRW. She flexes her R knee and extends her L leg thru twd DRW with R sway and looking DRW. We are not in closed position but more semi DRW. His L is extended to the side, as in the standard action, but hers is crossed thru. But the two legs are extended in opposite directions. There was one weight change for each. In a loose closed position and on the "&" of the previous beat, step small fwd L (woman bk R) onto the ball of the foot, sharply lower, and extend the trail foot with the inside edge of the foot in contact with the floor. Both sway and look right (woman left) toward the extended leg. If beginning in SCP, the lady will step fwd R and pick up to CP and then lower as described above. The step is a springing step. Often, you will begin in semi-closed position with the trail feet free, and the cue will be "thru to a jete point." The bombshell is certainly not a standardized figure, but it seems to include a floor ronde of either same footwork (split ronde) or opposite footwork (double ronde) in a sharp, explosive manner and perhaps with sharp rise and lowering. In a relatively developed form, the bombshell is a double reverse; split ronde; reverse fleckerl. Notice that the double reverse is danced with relatively high poise, the split ronde is explosive and lowered, and the fleckerl is again up and rapid – it's all very bombshelly. The term bombshell is also used to refer only the split ronde part of the sequence. YouTube has a Japanese video that shows this. In the caption to the video, the double reverse is listed separately, and in this case the subsequent contra check to a rudolph ronde is labeled separately (again, an explosive combination).